While we're not big fans of the word "zesty", we do have to acknowledge it as an important term in world of pickles. It means they have some garlic and heat - and that's how we like them. The Vlasic zesty dill was our pickle of choice - that is until we started making our own. Pictured above is our latest batch. Of course it all starts with the cucumbers. You need to use really firm, fresh, un-waxed cucumbers - straight from the garden or farmer's market is best. 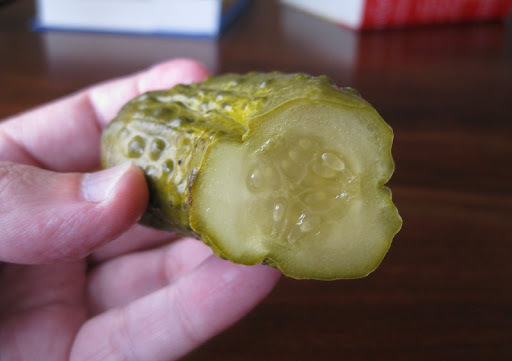 Pickling cucumbers are smaller than normal, just 3 or 4 inches long. This ends up being important when you are trying to fit them into jars. 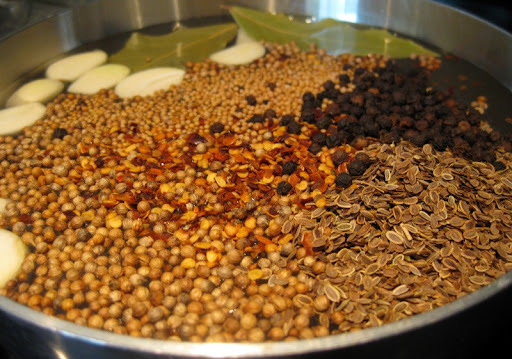 Our pickling spice blend consists of plenty of fresh garlic, dill seeds, whole coriander seeds, mustard seeds, black peppercorns, hot chile pepper flakes and bay leaves. The first time we made pickles we didn't add the pepper flakes or dill seed and while they were good, they were mostly too sweet. Since then we have adjusted our recipe to create the kick we like. 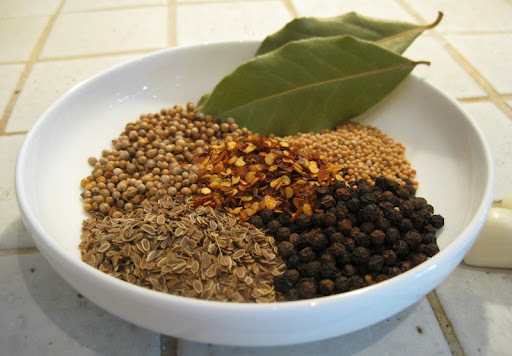 To get things started, all the seasonings get dumped into a sauce pan along with a 50-50 mixture of water and distilled white vinegar, along with some sugar and salt. While the pickling brine simmers for a few minutes, I pack in as many cucumbers and fresh chiles as I can into clean jars, trying to get a nice, snug fit. We throw in whatever ripe, fleshy chile peppers we have growing out on our patio. Red or green - they both work. After a few weeks in the refrigerator, these cucumbers will be transformed into lovely pickles - full of salt and vinegar twang, garlicky heat, and with that perfect crunch when you bite into them. And the chiles aren't just for flavoring - they are quite tasty in their own right. Spice mixture makes about 5 cups of brine - more than enough for 2 quart jars filled with pickles and peppers. 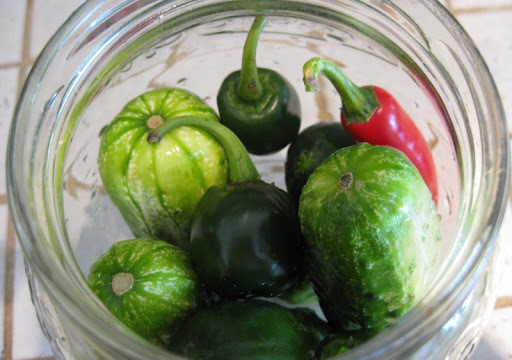 To decide how much you need, place your clean cucumbers and chiles snugly into your jars. Fill the jars with water, then pour off the water and measure the amount you used. 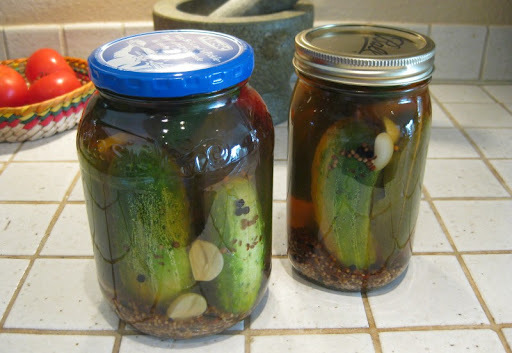 Adjust the quantity of pickling brine if required. 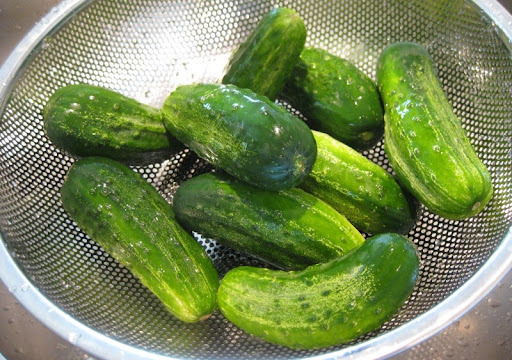 Carefully clean your cucumbers of any dirt or grit. Pack them into clean jars, filling the spaces with a few chiles. If desired, measure the amount of brine needed as described above. Add everything else to a saucepan and bring to a boil. Simmer for 5 minutes, remove from heat and let cool 5 minutes. Pour the hot liquid and spices over the cucumbers and chiles, filling the jars nearly to the top and distributing the spices evenly. Seal each jar with a clean lid, let cool to room temperature, then refrigerate. Pickles will be ready in about 3 weeks, but will improve after a few months. This is exactly what I needed for the 20 serrano peppers on the pepper plants. Thanks for the recipe! Hi Carol - glad to help! Another good one you two! I'm going on vacation today, but in a week I'll be all over this one. Thanks! Dave - do give them a try. Oh, and we forgot to mention it in the post, but this recipe is also great for pickling other vegetables - green beans, radishes, etc. How did you clean and seal the jars? Do these go through a canning process? Or are they just kept in the fridge? Hi Becky - The jars are just sent through the dishwasher, and since you cap them while the brine is still hot, the screw-top lids are basically self-sealing. They don't require extra processing, but yes, they should always be stored in the fridge. Looks great-I love this method, I've been going through my fair share of Zucchini pickles (here in Ohio I usually get about 10 zucchini thrown at me as I'm walking through). Andrew - sounds like a perfect way to handle a glut of zucchini. 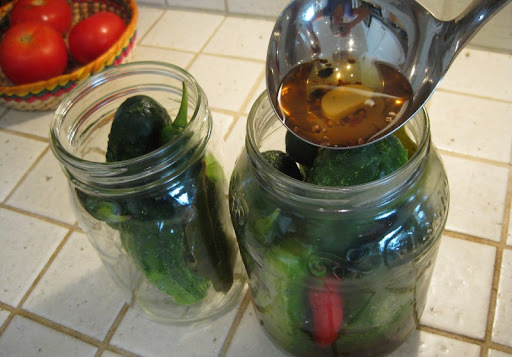 this is so awesome...i love pickles and have wanted to give it a shot, and now i have a great recipe to use! thanks for sharin and i'll be reportin back to you within a few weeks =) never heard of pickled green beans, but that sounds great too! Hi Sawyer - pickled green beans are tasty. They make a perfect garnish for a bloody mary. I made these yesterday - 5 jars! It was so easy. Two jars contain jalapenos and dried chili flakes and three jars are straight up garlic dills. I used fresh dill instead of the seeds, b/c I couldn't find the seeds.The dill made the house smell so good! I can't wait until they are pickled - I will report back. Becky - glad you are giving it a try! We've never tried fresh dill, so definitely let us know how they turn out. I made several jars yesterday and they look tasty. How long do yours keep in the refrigerator? I might heat-process several jars depending upon the shelf/fridge life. Hi Jamie - they need to be refrigerated, but they keep really well. We've gone over a year with no problems at all. 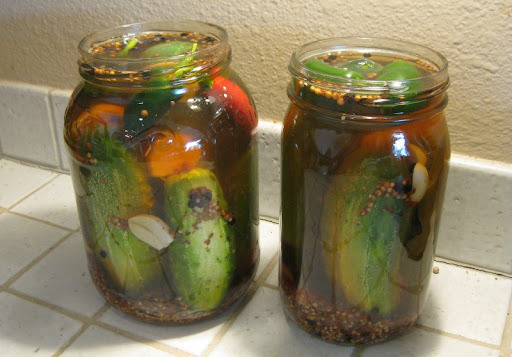 I don't have pickling cukes, anyone cut "spears" and try this? Hi Matt - we've only used whole cucumbers, but I think it should mostly work with spears. You won't get the same crunch, though. Hi again - we cracked open the first jar of these dills last night and they are delicious! The jar we opened was one of the mild jars that I made without jalapenos. The fresh dill worked out great by the way. Hi Becky - happy to hear that they turned out well for you! They will get even better as they sit longer. I'm going to try these out today. This is perfect because my dill went to seed and there's not much else on it. I think I'm going to try it with a mix of vegetables too. I love pickled carrots and cauliflower. Hi Katie - pickled cauliflower sounds great! I finally came around to making these today with a mix of cucumbers, jalapenos, some other medium heat pepper (I forget the name), and a couple of random green beans where I could squeeze in. Hopefully I didn't mess it up somehow...I'll let you know how it goes! Hi sawyer - good luck with your pickles. I'm sure they will turn out well. We're due to make a batch ourselves with cucumbers from the garden. Does this recipe work for canning as well? I assume it should be fine. But you had previously mentioned that they need to be refrigerated... Any tips would be greatly appreciated! Yes, we've also used this recipe for canning. The pickles end up being less crunchy because of the cooking, but the upside is that you don't need to refrigerate them. I just wanted to share that I've been making multiple jars of these things since I last commented, and I love them! I've been getting different kinds of peppers at the Farmer's market as well, so it's been a lot of fun, and my friends, whom I've made some for, love them too! So, thank you for sharing! Hi Sawyer - sounds like you've turned into a pickle-making expert! Hello. I have another quick question. I just bought some green tomatoes at the Farmer's Market that are regular/large size. Do you recommend that I put them in whole or slice them? I ended up quartering them and slicing them =) I've actually never had green tomatoes before and really loved the firmness and taste! My cousin also said it makes good for kimchi. I'll let you know how it goes! And an early happy Thanksgiving to you both! If I were to can these how would I do it? Do they still have to be refrigerated for three weeks or can I seal the jars and just leave in pantry for at least three weeks? Hi Sara - if you can them by heat processing them using the standard boiling technique, then they do not need to be refrigerated. They really aren't as good as refrigerator pickles, though. Water bath canned these today. I only changed it up by not adding the garlic or dill seed to the brine. I then added two whole peeled clovesold garlic to each jar before the cucumbers, a half head of dill plus some fresh dill to the jar. Then I added the reccomended amount of pickle crisp to each jar an filled with brine. Hoping this helps combat the dreaded soggy pickle. Tons of cucumbers in the garden but not enough room in the fridge. I also threw some summer squash cut into spears with the brine and put them in the fridge to sit for a while so we can see how Thoose are! I will try to remember and report back the flavor and crispness! Hi Kate - definitely let us know how they turn out. My first attempt at this. After about 2 weeks I noticed a fuzziness to the brine. Is this normal or should I be worried? Hi Huathe - our brine has always stayed clear. It takes on an amber hue from the spices, but no fuzziness or cloudiness. forget the pickles.. I just want the juice !